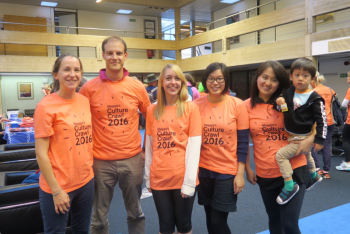 On Friday 23rd September two members of the brp team, Richard and Jennie, joined up with friends to take part in the Maggie’s Culture Crawl 2016. Appropriately called the ‘Wandering Blisters’, the group of 5 met at the Said Business School, in Oxford to start the preparations for the lengthy night-time ‘stroll’! Maggie’s Centres play a pastoral role in supporting cancer sufferers, and their families, in relaxed domestic environments, as opposed to what can often be an intimidating hospital environment. Maggie’s was started by architectural theorist Charles Jencks, for his wife Maggie and remains as her legacy. As such, any new centres are always designed by award-winning architects and the organised Culture Crawls seek to take in some of the architectural highlights of the cities within which the various Maggie’s Centres are located. Once we had registered, collected our t-shirts and the route map; we were left to personalise our t-shirts with the names of the people we were remembering. This year the walk was a total of 8 miles, and included some amazing cultural stops along the way. Once on board they took us along the river into the centre of Oxford, giving us views of the College boathouse’s and views over Christ Church Meadow all to the tune of a cut-throat group of sea-shanty-singing pirates. The first stop was the contemporary art gallery OVADA. The exhibition was entitled [inside] OUTSIDE which included a diverse range of art installations from music, to film, to interactive pieces and much, much more. The pieces were impressive and a great first stop along the 8 mile walk. Following this, spirits were high as we wandered towards the next stop – The Story Museum on Pembroke Street. Not knowing what to expect from this, we were not left in suspense for long. The first room had been set up to represent the Mad Hatter’s tea party, with many references to the literary classic, ‘Alice in Wonderland’ by Lewis Carroll, written in Oxford. The next setting was Narnia, and true to the story; we entered through the back of the wardrobe into the winter wonderland beyond, just as occurred in the famous book by C S Lewis. The next section of the walk was the longest, but luckily it was also the flattest, and took us towards the stop we were all most excited about; ‘The Castle Unlocked’. Upon arrival a guard took us into the basement of Oxford Castle, where we were then met by a group of actors who told stories about the building’s famous inhabitants. We were also given a talk about the history of the castle and its use as a prison – all of which was fascinating. At the end of the tour, we added our own stop at the Malmaison hotel, conveniently located within the medieval castle itself – a sensitive, ‘light touch’ conversion of the former prison! Internally, it is an amazing spectacle, with many original features left in place and is hopefully the closest any of us are going to get to experiencing being locked up! Our penultimate stop was Magdalen College, where we entered through the Porters’ Lodge. Once inside, it was as if we had stepped back in time hundreds of years! Our first stop within the college was the Chapel where a female choir entertained the tiring group. It has to be said their performance was amazing, enhanced further by the intimacy of the chapel. Moving on from here we exercised the option to add additional distance to our walk! Three hours in, was this was the most sensible decision? However, we couldn’t resist getting to see the Cloister and St Swithun’s Quad. In hindsight, this proved to be a fatal mistake, as little did we know that the final stretch was going to be the hardest part of the crawl!!! We finished with a 3 mile walk uphill, although it felt more like a mountain! Having started the walk at 6:30pm the time was now 11pm – we were all tired by this point and it has to be said the seemingly endless hill was not a welcome sight! 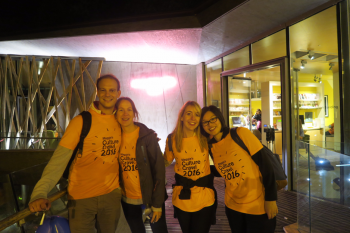 However, using the motivation of the money we had raised, coupled with the fantastic atmosphere of the night, we dug deep and finally made it to the Maggie’s Centre. We were greeted by the staff, who had kindly prepared lots of food and drink that was ready and waiting for us all to tuck in. From an architectural perspective, the Centre itself was beautiful, managing to feel both homely, welcoming and functional at the same time. All in all, it was a fantastic evening and thoroughly enjoyable event. We are still collecting sponsorship, so if you would like to support the amazing work that is done by the Maggie’s Centres you can donate here. On behalf of the ‘Wandering Blisters’ we would like to say a massive thank you to all who have donated already. And we would also like to thank the Maggie’s Centre team for the fantastic evening that was had by all.